The oscillating floor cleaner method is an extremely effective method for renovating, polishing and maintaining stone floors. It can be used to clean every type of stone floor. The method can be used to renovate, polish and clean all types of limestone. Examples include marble, Chinese hardstone, Belgian bluestone and terrazzo. The oscillating floor cleaner method is a safe way of cleaning natural stone floors. Thanks to the effective movement, you only have to use water. You do not need to use any hazardous cleaning products. A natural stone floor can only be renovated if the tiles are made of limestone. To be sure that the surface to be renovated is limestone, we recommend first performing an acid test on a part of the floor that is not easily visible. Make sure you have clean water and a dry microfibre cloth available. Apply one drop of descaler (pH 1 or 2) to an area which is out of sight. If the product immediately turns white, collect it straight away with the cloth and then rinse and clean the area with water. 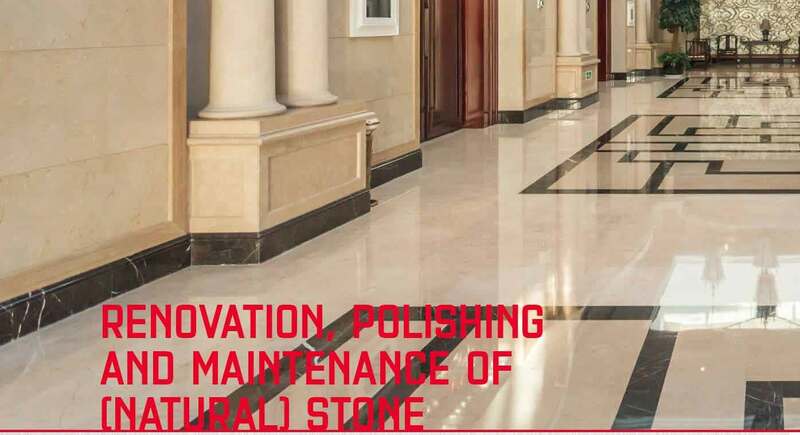 If the product turns white, you know that the surface is limestone and that it can, therefore, be renovated and polished. If it does not turn white, the oscillating floor cleaner method can only be used to clean the surface. The last step in the renovation process is polishing. The oscillating floor cleaner method can be used to give the surface either a medium-gloss finish or a high-gloss finish. After renovation, the floor can be cleaned every day using the pad that was last used during the renovation process. If the Diamond Green pad was used for finishing, then this pad should also be used for the daily cleaning of the floor. The pads are also available as 17” pads for use under a floor scrubber/drier. It is not necessary to use a cleaning product. Pad laatste stap renovatie proces. Use step 1 as the normal process. Then carry out the other 3 steps. Carry out step 4 after the normal process. It is not necessary to add a cleaning product. For when the surface starts to become glazed, but does not have any deep scratches.